In a game of political chicken, rivals in the close 49th Congressional District race have sent each other tough letters threatening lawsuits. At issue is a commercial by retired Marine Col. Doug Applegate, the Democratic challenger to incumbent Rep. Darrell Issa. Issa at the time demanded a full-page retraction and said the article, by Pulitzer Prize-winner Eric Lichtblau, had 13 errors. The Times eventually published four corrections. Days after the Applegate ad began airing, a lawyer for Issa’s campaign sent a three-page letter to Applegate and his campaign manager, Robert Dempsey, in Solana Beach. “The advertisement contains false information deliberately and knowingly intended to mislead California voters and defame Congressman Issa’s reputation,” said the lawyer, J. Randy Evans of Washington. In his letter dated Sept. 29, Evans demanded the ads cease and Applegate issue a public apology. “In the event that Colonel Applegate and the campaign refuse to do so, Congressman Issa intends to vigorously pursue all legal rights and remedies available to him,” Evans said, attaching a draft defamation complaint that he said would pass muster with libel law involving public figures. On Monday, the Applegate camp responded with its own letter. Werbrock, based in Oakland, said The New York Times corrections were on “three minor points” not material to the thrust of the ad. 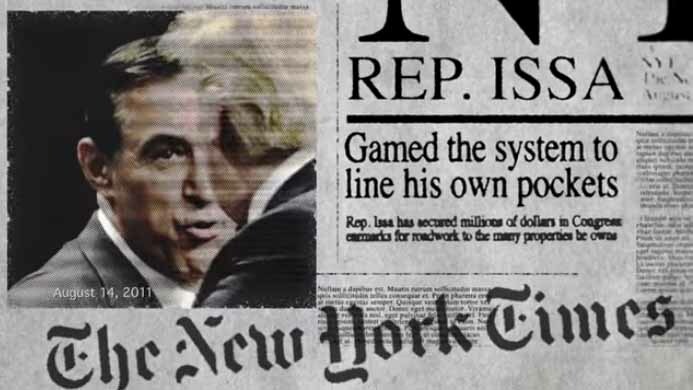 Issa’s claim centers on a screenshot where the “gamed the system” quote is rendered in a newspaper-style headline, above a New York Times logo displayed on a slant, Nir noted. “It’s the kind of visual technique used in a million campaign ads,” he said. It’s rare for incumbents to spend money attacking challengers unless the race is close, she told the paper. Issa won the June primary with 50.8 percent of the vote, 5.3 points ahead of Applegate in a district that includes south Orange County and north San Diego County. According to voter registration figures released Monday, Republicans hold a slim 35.7 percent to 33.2 percent edge over Democrats in the 49th District, with 26.9 percent listed as independents. Opensecrets.org says Issa as of June 30 had raised $751,393 to Applegate’s $186,104. But Issa had $3.7 million cash on hand. Applegate had $50,541. Applegate’s ad showed a 9/11 responder saying Issa and Tea Party Republicans “tried to play politics with our lives” when they voted against a bill providing health care to 9/11 first responders. On Dec. 18, 2015, Issa joined the “yes” majority in reauthorizing the James Zadroga 9/11 Health and Compensation Act.